The Armoured Personnel Carrier is a lightly armoured vehicle designed to transport infantry across the battlefield, to a point were they disembark and fight. An Infantry Fighting Vehicle goes one further in that it has the offensive weaponry to support and work along side those infantry and the Russians were the first to produce such a vehicle which was called the BMP (short for Boyevaya Mashina Pekhoty, meaning “fighting vehicle of infantry”). It was first seen in 1967 and the nearest vehicle the West had was the German Marder and its service entry date wasn’t scheduled until 1970/1 and even that vehicle couldn’t match the BMP’s firepower. The engine located at front right of the vehicle, drivers station on the left (he has his own hatch and up to x5 periscopes. Behind him is the vehicles commander. The 1 man turret is located in the middle of the vehicle and is manned by the gunner. The turret occupies the same area that the infantry are sat in (its in essence open planed). The rear of the vehicle accommodates 8 infantrymen. They sit four a piece, back to back on two benches facing outwards. In front of them are firing ports that they can insert their rifle’s/machine guns and have a small periscope each so that they can see what they are shooting. Separating the benches is a tall fuel tank that runs the length of them. The infantry exit the vehicle via two large doors in the rear (which also double up as fuel tanks) and have roof hatches above their benches. The vehicle is a welded steel plate construction of varying thicknesses. Over all its protected against 7.62mm MG fire and higher calibre’s up to 20mm across the frontal arc. The vehicles shape also helps, with its sloped surfaces deflecting shots and low silhouette (height) making it a harder target to hit. The engine also serves as a crude form of armour as its up front in the vehicle. The crew and infantry are fully protected from NBC threats, as the vehicle is fitted with an over pressure system (creates a vacuum forcing air out of open holes such as the main gun and firing ports so as contaminated air cant get in) as well as an air filtration system that filters out airborne containments. Drive sprockets are at the front with six road wheels, using torsion bar suspension. The BMP-1 has a ground pressure of 0.6 kg/cm² and is able to cross snow and boggy terrain. It has the range, off-road speed and cross-country ability necessary to keep up with fast-moving MBTs. The vehicle has an amphibious capability for crossing lakes and rivers. The tracks propel the vehicle whilst in the water and a trim vane is erected at the front of the vehicle. The vehicle was given an anti-tank fighting capability with a 73mm smoothbore main gun and a wire-guided Anti-Tank Missile. The 73mm Main Gun is the 2A28 “Grom”, which is capable of firing the PG15V HEAT and OG-15V high explosive rounds. The Grom has an autoloader which is attached to 40 round magazine which runs along the inside of the turret. The original models prior to modernization had a mount above the main gun with which the a 9M14 “Malyutka” (AT-3 Sagger) ATM was fired from. 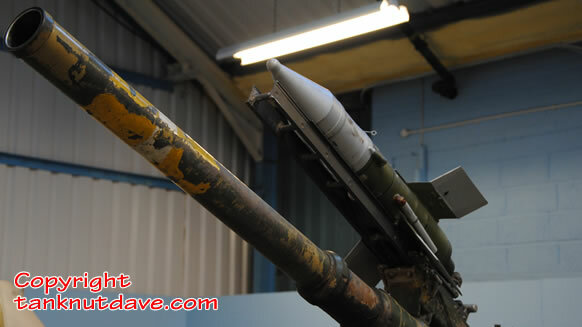 It would be guided on to enemy armour via a sight with the gunner making changes to its flight with a controller that passed this information on via wires attached to the missile at one end and the other attached to the vehicle. During its service life, new missiles were used (please see below models). The vehicle has a coaxial 7.62mm PKT machine gun, which is mounted to the right of the main gun. 2,000 rounds are carried. The turret lacks a stabilization system, so its weapons can not be fired accurately whist the vehicle is on the move. Developed by Pavel Isakov (Design Bureau of the ChTZ) and manufactured by the Kurgan Engineering Works (KMZ) in the former USSR for the Soviet Army. The Ob’yekt 765Sp1 went into production with the Soviet Army in 1966 and was produced until 1969. The Ob’yekt 765Sp2 was produced from 1969 until 1973. The Ob’yekt 765Sp3 was produced from 1973 until 1979. A number of improvements were made to the reliability of the chassis, the engine and transmission during mass production. The Ob’yekt 765Sp4 aka BMP-1P was produced from 1979 to 1983 and was armed with a more powerful ATM launcher 9P135M-1 (set back on to the roof of the turret) for the ATM “Konkurs”/”Fagot”. 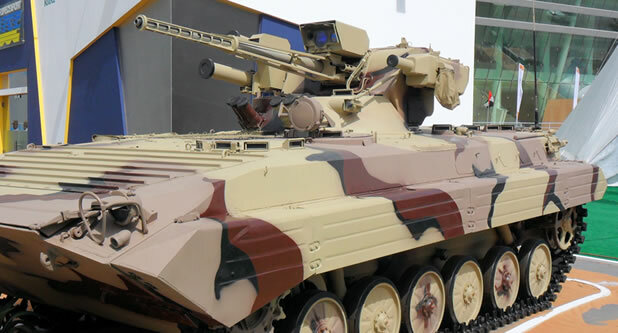 The BMP-1M is a modernization package developed by the Tula Instrument Engineering Design Bureau (KBP) and was shown publicly for the first time at the IDEX’99 International Exhibition in Abu Dhabi. It is fitted with a TKB-799 “Kliver” one-man weapons station armed with a missile pod, a 30 mm 2A72 multipurpose chain gun and a 7.62mm PKTM coaxial MG. The missile pod is mounted on the right side of the weapons station and normally holds four 9M133 Kornet (AT-14 Spriggan) or 9M133F “Kornet” ATGMs with a laser jam-resistant fire control system, but these can be removed and replaced by a pod of 9K38 Igla (SA-18 Grouse) surface-to-air missiles. It carries 300 rounds for the main gun, 2000 rounds for the machine gun and 4 ATGMs. It also has a modern computerized fire control system with a two-plane stabilizer and a 1K13-2 telescopic sight with distance measurement/thermal/laser channels and ballistic calculator with external sensors. The first BMP-1M was tested at the AFV Research Institute in Kubinka in 1998. Its reported that the Russian army plans to upgrade all of their BMP-1s and BMP-1Ps to BMP-1M level. BMP-1K (Ob’yekt 773) (K stands for komandirskaya – command) – Command variant of the BMP-1 for motorized rifle regiments, developed in 1972. 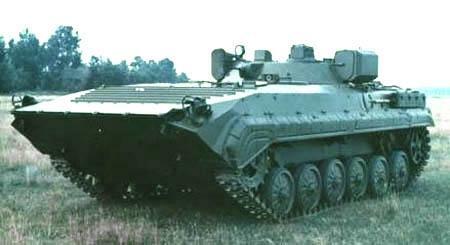 One of the most common BMP-1 conversions. Production started in 1973. Standard armament was preserved. The troop compartment was redesigned to accommodate field tables and map boards. There is seating space for three officers. It has an additional antenna, R-123M and R-111 radios and a GPK-69 navigation system. All firing ports except for the one in the left rear door and periscopes were blocked (all machine gun firing ports were welded shut along with all firing ports on the right hand side of the hull). Some are equipped with the GLONASS navigation system. NATO gave it the designation BMP M1974. BMP-1K1 – Platoon command variant of BMP with two R-123M radios. BMP-1K2 – Company command variant of BMP with two R-123M radios. BMP-1K3 – Battalion command variant of BMP with one R-123M and one R-130M radio. BMP-1KM – Improved command variant of BMP. BMP-1PK – Command variant of BMP-1P for motorized rifle regiments, equipped with R-126, R-107 and two R-123M radios. It replaced the BMP-1K in serial production. The BRM-1 (Ob’yekt 676) entered service with the Soviet Army in 1972, production began in 1973 when the first BRM-1s were passed to reconnaissance subunits. It was fitted with an extra-wide, low-profile, two-man turret which was moved to the rear of the hull and without the M3 autoloader and the 9S428 ATGM launcher. The vehicle has a ground surveillance radar, laser rangefinder and additional R-123M, R-130M, R-148 and R-014D radios are all fitted. The PRP-3 “Val” (Ob’yekt 767, 1ZhZ) (PRP stands for podvizhnoy razvedyvatel’niy punkt – mobile reconnaissance post) – Is a BMP converted into an artillery reconnaissance vehicle. It entered service with the Soviet Army in 1970. The vehicle was fitted with two R-123M or R-108 radios and optical devices which enabled it to function in the artillery/guided missile target indication, fire adjustment and/or artillery/mortar locating roles. It was armed with one PKT machine gun in a ball mount in front of the new, bigger, two-man turret which was positioned further back than in a normal BMP. BREM-2 (BREM stands for bronirovannaya remonto-evakuatsionnaya mashina – armored maintenance-recovery vehicle) – The turret has been removed and replaced by an armoured plate. The vehicle is fitted with a load platform with a capacity of 1.5 tonnes, a crane with a 1.5-tonne capacity (7 tonnes with additional outfit), which is placed on top of the hull and a pull winch with a 6.5-tonne capacity (19.5 tonnes with block pulley), which is placed inside. It also carries additional repair and recovery equipment on the top and sides of the hull. BWP-1 stands for Bojowy Wóz Piechoty-1 “Infantry Fighting Vehicle” which is the Polish designation for a Soviet BMP-1 (Ob’yekt 765Sp2 and later Ob’yekt 765Sp3). Military Motorization Works No. 5 licence built 274 by the end of 1988 in addition to the 1406 ordered from Russia in 1969. BWP-1M “Puma 1” (BWP-1M stands for Bojowy Wóz Piechoty-1 Modernizacja “Infantry Fighting Vehicle-1 Modernization”) – Polish modernization of their BWP-1. Includes new sighting equipment, 81mm shrapnel grenade launchers, communications (internal & external) fire suppression, improved amphibious capability and in 2005 Puma vehicles received a new Iveco engine. The Puma has been used to mount a number of various turrets as prototypes. Poland also bought 22 BWR-1D (BRM-1K) reconnaissance vehicles in 1987 from the USSR and 16 BWR-1S (modernized BPzV) reconnaissance vehicles from Czech Republic in early 1990s. Several hundred were ordered in the early 1980’s from the former Soviet Union and built under licence. They are being gradually replaced in service with the BMP-2. The Indian version differs from the basic model, having a slightly altered turret design. 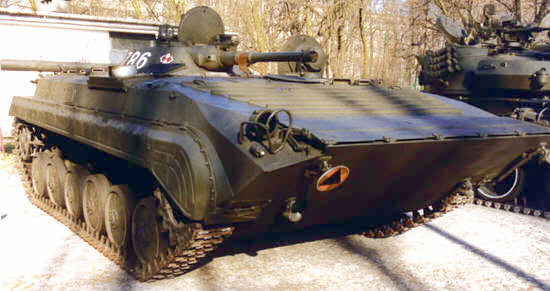 BVP-1 (BVP-1 stands for Bojové Vozidlo Pechoty – 1 – “Infantry Fighting Vehicle – 1”) – Czechoslovak designation for the BMP-1. BVP was manufactured by ZTS Dubnica nad Váhom. BVP-1 2,252 ordered in 1973 and delivered between 1973 and 1989 (most produced in Czechoslovakia while the rest was imported from the Former Soviet Union). BVP-1K – Command version of BVP-1. BPzV “Svatava” – It was fitted with a passive observation system on the commander’s station, improved armament, protection and mobility, a PSNR-5K “Tall Mike” external tripod radar, an NNP-21 observation system and an additional 902S eight barrelled smoke grenade launcher on the rear of the turret. The crew was increased from 3 to 5. BVP-1 “Strop” – ABVP-1 with the turret replaced by twin 30 mm PLDvK vz.53/59 anti-aircraft guns. Developed in the mid-1980s. It has a new commander’s hatch located to the front right of a two-man turret. The turret is further to the rear than on a BVP-1 and has no hatches, so the crew enters through the rear doors. In the front and below the gun mount is the housing for the various sights associated with controlling the weapons. The Czechoslovakian Army evaluated the vehicle but did not accept it for service. Several examples were seen in use by Angolan and Cuban forces during the Angolan Civil War. Vz.85 ShM-120 PRAM-S (samohybný minomet) – 120 mm automatically loaded Model 1982 self-propelled mortar with a range from 504m to 8036m mounted on the BVP-1 chassis in a low casemate superstructure in the rear half of the vehicle. Its role is to bring sustained fire support to mechanized units. The mortar has a rate of fire of 18 – 20 rounds per minute and is capable of firing 40 rounds in 5 minutes or 70 rounds in 10 minutes. Total ammunition load is 80 HE, SMK and ILL rounds including 21 in the automatic loader. Apart from the mortar the vehicle is equipped with a 9M113 Konkurs (AT-5 Spandrel) ATGM, a 12.7 mm NSVT heavy machine gun, RPG-75 anti-tank grenade launchers, F1 hand grenades and Model 58 7.62 mm submachineguns. BVP-1 AMB-S (ambulantné vozidlo) – Raised structure over the troop compartment and room for 4 stretchers. There is a small IR searchlight on top of the troop compartment. VPV (VPV stands for Vyprošťovací Pásové Vozidlo) – developed at the ZTS Martin Research and Development Institute. Production commenced at the plant (which is now in Slovakia), in 1984. It is equipped with a 5 tonne powered crane, a heavy winch, and a wider than normal troop compartment. Hatches on top of the turret and the troop compartment have been removed. 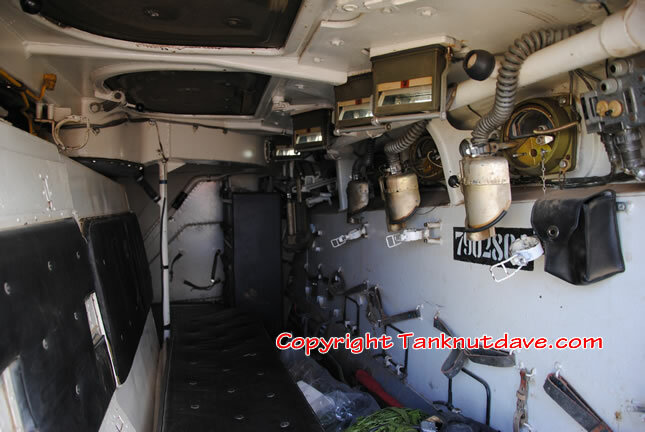 The vehicle is divided into four compartments: engine, commander’s, driver’s and repair/cargo. The crew consists of a commander/crane operator, driver/welder/slinger and a logistician/mechanic. The vehicle is armed with a pintle mounted 7.62 mm PKT machine gun. SVO (SVO stands for Samohybný Výbušný Odmínovač) – It does not have a turret and is fitted with a Hedgehog type of launcher for 24×245 mm Cv-OŠ-SVO FAE-rockets in the rear troop compartment (each rocket weighs 41.5 kg). The first launched rocket has a range from 350m to 530m. The last rocket has a range from 250 m to 430 m. All 24 rockets can be ripple-fired within 64 seconds. The cleared area is a 5 m x 100 m corridor. The operator has a work station in the right hand side of the rear of the hull. The Shkval is an integrated, modular weapon station. It was developed by the State Scientific Technical Centre of Artillery & Rifle Arms of Ukraine. The Shkval turret includes KBA-2/ZTM-1 30mm cannon, KT-7.62 7.62mm coaxial machine gun, AGS-17 30mm automatic grenade launcher, and anti-tank missile launchers. The rotating Shkval weapon station carries 350 30mm rounds, 2,500 7.62mm rounds and 29 ready-to-fire grounds for the 30mm grenade launcher with an 89 additional rounds in reserve. The weapon station also carries two side-mounted wire-guided Red Arrow 8 (HJ-8) or Konkurs anti-tank missiles. The module is fitted with an stabilized fire control system with an operating range of 4,000 or 700 meters at daylight or night respectively. as well as six (3+3) 81mm smoke/aerosol grenade launchers. Fitted with the IST Dynamics Unmanned Multi-Weapon Platform armed with a 30 mm 2A72 autocannon, one 7.62 mm PKT coaxial machine gun, an ATGM launcher for three Denel Ingwe ATGMs on the left-hand-side of the weapons station and a 40 mm Denel-Vektor automatic grenade launcher. Its vision devices include a day/night gunner’s sight incorporating the missile guidance unit and a panoramic primary stabilized commander’s sight. It is also fitted with a digital ballistic fire control computer. This vehicle was shown at the 2006 Africa Aerospace and Defence exhibition but only with a dummy of the weapons station. East Germany prior to reunification operated a fleet in excess of 1000 BMP-1’s. These were inherited by the German Bundeswehr who modified 581 to bring them up to NATO safety standards. The fuel tanks in the rear doors were filled with foam, new driving lights, rear view mirrors, and MB smoke grenade launchers were fitted. The ATGM launcher was removed as was the autoloader, additional steps and slip resistant surfaces were also added. These modified vehicles were designated the BMP-1A1 Ost. Ukraine – An estimated 2500+ were in service during the mid-90’s, however this number has been increasingly reduced, whilst a number of those in service have been modernized to the indigenous BMP-1U standard and others have been converted into ARV’s. Syria – Between 150 to 170 were delivered before October 1973 for the Yom Kippur War. A further 2300 were ordered in 1977 from the former Soviet Union and were delivered between 1977 and 1989. Sweden – 12 ordered from Germany in 1993 and delivered between 1995 – 1997 for trials. A further 360 were ordered from Germany in 1994 and were delivered between 1998 and 2001 (the vehicles were modernized in Poland before being delivered). They were all upgraded to the indigenous Pbv 501A standard. 340 were in service as of 2006, but in the same year they were withdrawn from service and later sold. Slovakia – Originally 383 BVP-1s, 120 BPzV “Svatava”s and 207 OT-90s were inherited from the former Czechoslovakia in 1992 (with which Slovakia was part of). The number in service has dropped. Russia – An estimated 20,000+ vehicles were produced for the Soviet Army and export. Currently there are around 750 in active service and more than 10,000 in reserve as of 2009 with the Russian Ground Forces. Romania – A total of 184 were built by ROMARM SA in Burcharest from 1983 onwards. In recent years Romania has been upgrading their vehicles. Poland – 1,406 BWP-1’s were ordered in 1969 from the former USSR and were delivered between 1972 and 1979. 274 were licence built by 1988. Poland also bought 22 BWR-1D (BRM-1K) reconnaissance vehicles in 1987 from the former USSR and 16 BWR-1S (modernized BPzV) reconnaissance vehicles from Czech Republic in the early 90’s. The Polish Ministry of Defence states that as of the 8th January 2006 there were 1,298 BWP-1’s in service. Mozambique – An estimated 40 were in service as of 2003. Mongolia – Deliveries of 400 from the former USSR were completed during the 1980. Libya – 800 were ordered in 1979 from the former USSR and delivered between 1979 and 1982. Their status following the 2011 Civil War is not clear following the claims by Western Air Forces of the destruction of Libyan Armoured Fighting vehicles. Kyrgyzstan – There were 349 in service as of 1995 and 274 as of 2000 and 2005. Korea (North) – Status not fully known. Kazakhstan – Its estimated that around 200 in service in the last decade. Israel – Following the the Yom Kipper War, captured Egyptian/Syrian vehicles were fitted with the CARDOM 120/81 mm mortar system. The turret has been removed, the mortar and the recoil system protrude from the open compartment. It was built by Soltam. Iraq (current & present) – 200 ordered in 1973 from Soviet Union and delivered between 1974 and 1975. 750 ordered in 1981 from Soviet Union and delivered between 1981 and 1987 (the vehicles were produced in Czechoslovakia). Post 2003, 100 BMP-1A1 Osts ordered in 2005 from Greece and 110 ordered in 2006 from Ukraine. Currently the New Iraqi Army operates 434 BMP-1’s (including BMP-1A1 Osts). Iran – During the 1980’s 600 odd vehicles were ordered from both Syria and the former USSR, but were built by Czechoslovakia (Former). Its beleived that roughly 200 are still in service as of 2005. India – Known as the Sarath (Chariot of Victory) in the Indian Army, 700 BMP-1s are in active service as of 2008. The vehicle has been licence built and others purchased from the former USSR. 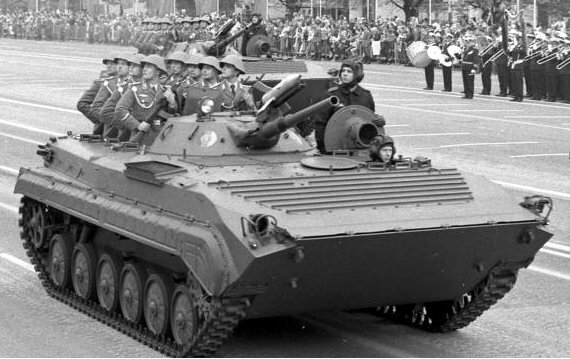 Hungary – 500 BMP-1s and BRM-1Ks were ordered in 1972 from the former USSR and were delivered between 1973 and 1978. Most are in storage. Greece – Originally 501 BMP-1A1 Osts were order from Germany in 1991 and delivered between 1992 and 1994. Greece offered 500 as aid to Iraq but only 100 were accepted in 2005 with 36 being delivered in 2005 and 64 in 2006. There were 377 BMP-1A1 Osts in service as of 2006. Germany – Taken from East Germany’s Army. 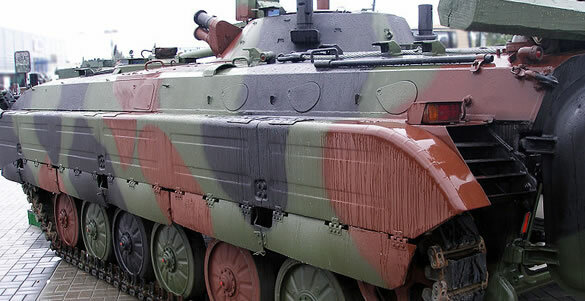 After the reunification, the West-German Bundeswehr modified more than 581 vehicles and gave them the designation BMP-1A1 Ost. Georgia – Originally 667 were inherited from the former USSR in 1991 following its break up. 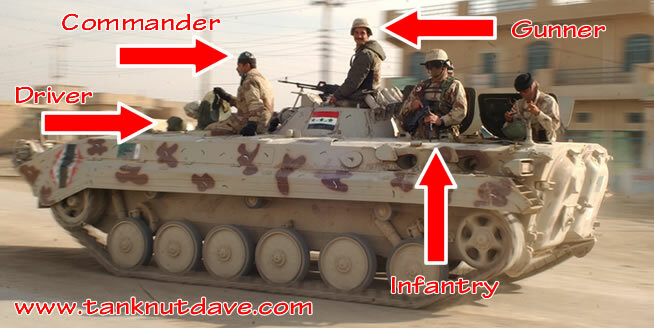 79 BMP-1P and BMP-1Us are in service as of 2011. Finland – 195 vehicles were supplied over 10yrs from the former USSR and Germany. all were modernized between 1994 to 1997 by Finnish Firm Patria. They were all withdrawn from Finnish Army service in 2004, thou the BMP-2 still remains in service. Ethiopia – 70 vehicles were ordered in 1977 from the former USSR and were delivered between 1977 and 1978. Eritrea – Understood to have received a number from Ethiopia. Egypt – Around 200 were delivered from the former USSR in preperation of the Yom Kipper War. In later years those to survive the war were upgraded to the BMP-1S. These had a French Poyaud 520 6L CS2 diesel engine developing 310hp. Czech Republic – 623 BVP-1’s were inherited from the Former Czechoslovakia in 1992. As of 1 January 2008 there were 207 BVP-1’s in service, but most are in storage. Czechoslovakia (Former) – BVP-1 2252 were ordered in 1973 and delivered between 1973 and 1989 (most produced in Czechoslovakia while the rest was imported from the Former Soviet Union). Vehicles were distributed between the two nations of Slovakia and Czech Republic, which had formed the former Czechoslovakia. Cuba – 80 ordered in 1978 from Soviet Union and delivered between 1981 and 1988. Bulgaria – 560 ex-USSR surplus bought. 100 BMP-1Ps are currently in service. 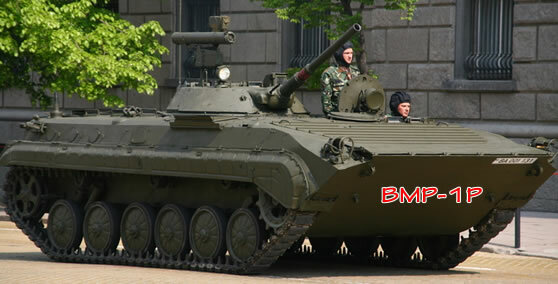 Belarus – Originally 938 BMP-1’s were inherited from former USSR in 1991. Around 150 are now in service. Azerbaijan – The country has only operated the vehicle since the 1990’s. Some where between 20 to 44 vehicles are in service. Armenia – Only a handful remain in service. Angola – Roughly 150 are in service. Algeria – Between 690 to 800 BMP-1’s ordered in 1978 from Soviet Union and delivered between 1979 and 1984. There were 684 BMP-1s in service as of 1996. Algeria signed a contract with Russia for modernization of 400 BMP-1s in 2006. Afghanistan – During the Soviet War in Afghanistan a number of BMP-1 IFVs fell into the hands of Afghan Mujahideen who used them against their former owners. Since then a number have had their turrets replaced by the ZU-23-2 anti-aircraft gun. It was used for fire support in the Afghanistan mountains. At present these vehicles and those of their original set up are operated by the Afghan National Army (ANA). Egypt & Syria were operators of the vehicle and the first to use it in combat as they led a coalition of Middle East nations in retaliation against Israeli to recapture the territories they had captured and occupied since the 1967 Six-Day War. The coalition eventually lost and a significant number of Armoured Fighting Vehicles which includes BMP-1’s were captured and pressed in to IDF service. The Lebanese Civil War (Arabic: الحرب الأهلية اللبنانية‎) was a multifaceted civil war in Lebanon. The war lasted from 1975 to 1990 and resulted in an estimated 150,000 to 230,000 civilian fatalities. Another one million people (a quarter of the population) were wounded, and today approximately 350,000 people remain displaced. BMP-1s were used by Angolan and Cuban units against South African forces during the Angolan Civil War. During the fighting in Angola, the BMP-1 proved to be a reliable vehicle with decent firepower. A few examples of the Czech BVP-1 “Strop” SPAAG, developed in the mid-1980s, had been seen in the hands of Angolan and Cuban soldiers. 9 BMP-1s were destroyed and 6 were captured by the South Africans during intense fighting in the Battle of Cuito Cuanavale in October–November 1987. 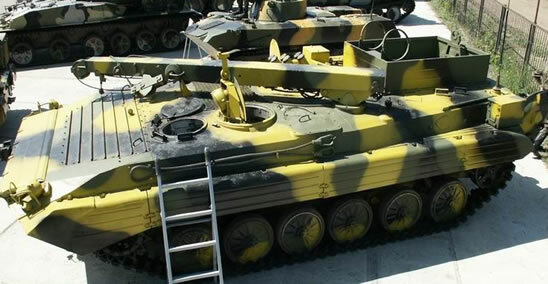 Captured vehicles were evaluated and recently used to develop a modernization package for the BMP-1. The Chadian–Libyan conflict was a state of sporadic warfare events in Chad between 1978 and 1987 between Libyan and Chadian forces. Libya had been involved in Chad’s internal affairs prior to 1978 and before Muammar al-Gaddafi’s rise to power in Libya in 1969, beginning with the extension of the Chadian Civil War to northern Chad in 1968. The conflict was marked by a series of four separate Libyan interventions in Chad, taking place in 1978, 1979, 1980–1981 and 1983–1987. Based on lessons learned in the Soviet War in Afghanistan, a version with improved fighting qualities, the BMP-2 was developed. It was accepted into service in August 1980. The Iran–Iraq War, also known as the Imposed War (جنگ تحمیلی, Jang-e-tahmīlī) and Holy Defense (دفاع مقدس, Defā’-e-moqqaddas) in Iran, Saddām’s Qādisiyyah (قادسيّة صدّام, Qādisiyyat Ṣaddām) in Iraq, and the (First) Persian Gulf War, was an armed conflict between the armed forces of Iraq and Iran, lasting from September 1980 to August 1988, making it the longest conventional war of the twentieth century. The Sri Lankan Civil War was a conflict fought on the island of Sri Lanka. Beginning on the 23rd of June 1983, there was an on-and-off insurgency against the government by the Liberation Tigers of Tamil Eelam. The vehicle was operated by Indian Peace Keeping Force’s (1987–90). The Georgian Civil War (1988–1992) and Abkhazia (1992–1993) / 1991 – 1992 War in South Ossetia / 1992 – 1993 – War in Abkhazia / 1989 Georgian-Ossetian conflict. The Persian Gulf War (August 2, 1990 – February 28, 1991), commonly referred to as simply the Gulf War, was a war waged by a U.N.-authorized coalition force from thirty-four nations led by the United States, against Iraq in response to Iraq’s invasion and annexation of the State of Kuwait. Iraq used the vehicle in its defence. The May-July 1994 civil war in Yemen was waged between the armed forces of the former Northern and Southern Yemeni states and their supporters. The First Chechen War, also known as the War in Chechnya, was a conflict between the Russian Federation and the Chechen Republic of Ichkeria, fought from December 1994 to August 1996. After the initial campaign of 1994–1995, culminating in the devastating Battle of Grozny, Russian federal forces attempted to seize control of the mountainous area of Chechnya but were set back by Chechen guerrilla warfare and raids on the flatlands in spite of Russia’s overwhelming manpower, weaponry, and air support. The vehicle was operated by Russian Ground Forces. The Second Chechen War, in a later phase better known as the War in the North Caucasus, was launched by the Russian Federation starting the 26th of August 1999, in response to the Invasion of Dagestan by the Islamic International Peacekeeping Brigade (IIPB). On 1st of October Russian troops entered Chechnya. The campaign ended the de facto independence of Chechen Republic of Ichkeria and restored Russian federal control over the territory. Although it is regarded by many as an internal conflict within the Russian Federation, the war attracted a large number of foreign fighters. The vehicle was operated by the Russian Ground Forces. The vehicle was operated by the varying war factions in fighting against the Taliban in the early days of the campaign. Since the formation of the Afghan National Army, the vehicles have been handed over to the ANA in the continued joint effort to defeat Taliban forces still fighting in the country. The invasion of Iraq (March 19–May 1, 2003), was the start of the conflict known as the Iraq War or Operation Iraqi Freedom in which a combined force of troops from the United States, the United Kingdom and smaller contingents from Australia and Poland invaded Iraq and toppled the regime of Saddam Hussein in 21 days of major combat operations. The vehicle was operated by the former Iraqi Army. The 2008 South Ossetia War or Russo-Georgian War was an armed conflict in August 2008 between Georgia on one side, and Russia and separatist governments of South Ossetia and Abkhazia on the other. The vehicle was used on all sides. The 2011 Libyan civil war (Arabic: الحرب الأهلية في ليبيا عام 2011‎ / ALA-LC: al-ḥarb al-ahlīyah fī Lībiyā ‘ām 2011) is an ongoing armed conflict in the North African state of Libya being fought between forces loyal to the country’s defacto ruler Muammar Gaddafi and those seeking to depose him. The vehicle is certainly been used by both sides.